Are you on a seafood-rich diet? 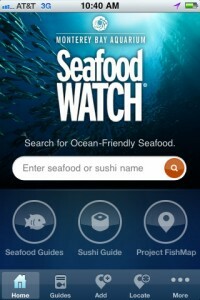 Then you need to download Seafood Watch, an iPhone app developed by the Monterey Bay Aquarium. This app helps you to choose the healthiest and most environmentally-friendly seafood dishes when going out to eat, and helps you avoid fish that is high in lethal contaminants. Seafood Watch works with your GPS to provide up-to-date info about seafood choices in your area. You can also add locations of restaurants in your area where sustainable, safe seafood is available. Seafood is very good for you, with some varieties of fish being very high in omega-3 fatty acids. But some seafood is also bad for you (due to high levels of mercury), or bad for the environment. For even a casual seafood fan, Seafood Watch is a useful tool to fill in the gaps that restaurant menus or grocery store price tags often have. Still, it is somewhat problematic that Seafood Watch doesn’t include info for Mexico, Canada, or other locations where users might frequently travel. Seafood Watch would be greatly improved (and would greatly increase their audience) if there was info for globetrotting travelers who need this info. 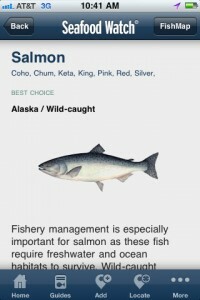 In addition to a solid array of fish info, the guide also as info for fish roe/eggs, shellfish, crustaceans, and more. Of special interest to members of the “green” lifestyle movement: Seafood Watch’s “Super Green List,” which includes the very best seafood options with info about how the fish were farmed, and which states produce the best product. For pregnant women or individuals who want to avoid mercury and toxic PCBs, this app could literally be a life-saver. Each type of fish is pictured and written up in extensive detail, making this a useful tool for self-education as well. Given the fact that many fish species are on the brink of extinction due to overfishing, this handy app is a useful guide for consumers who want to make responsible choices now to ensure that their favorite fish will still be around for future generations to enjoy. Thanks to a large location database and a easy-to-navigate design, Seafood Watch comes highly recommended to sushi fans, foodies, and environmentalists alike.